NEMA LD3 standard has been developed by NEMA Decorative laminate section. This standard provides test methods and performance values for hight pressure decorative laminates. 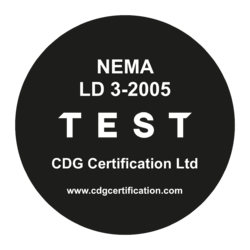 NEMA LD3-2005 revises & supersede NEMA LD3-2000.CDG is capable of running the full series of tests prescribed in NEMA LD-3 (2005). NEMA LD3 standard has been developed by NEMA Decorative laminate section. This standard provides test methods and performance values for hight pressure decorative laminates. NEMA LD3-2005 revises & supersede NEMA LD3-2000. The NEMA LD 3 standard has been in place for many years, has undergone several significant revisions throughout its history, and continues to be relevant to the decorative laminates industry. NEMA describes high pressure decorative laminate (HPDL) sheets which consist of paper, fabrics, or other core materials that have been laminated at pressures of more than 5.0 MPa using thermosetting condensation resins as binders. CDG is capable of running the full series of tests prescribed in NEMA LD-3 (2005).